I think everyone can readily admit that owls are cool. Most are creatures of the night, swooping soundlessly from above to scoop up their prey below. Their calls are eerie, but beautiful, almost like ghosts. Yet, these very qualities are what make them so difficult to see as birders, and in my years of birding I had managed to spot just two: the Snowy Owl (which is active during the daytime) and the Barred Owl. One particular family of owls had particularly evaded me. 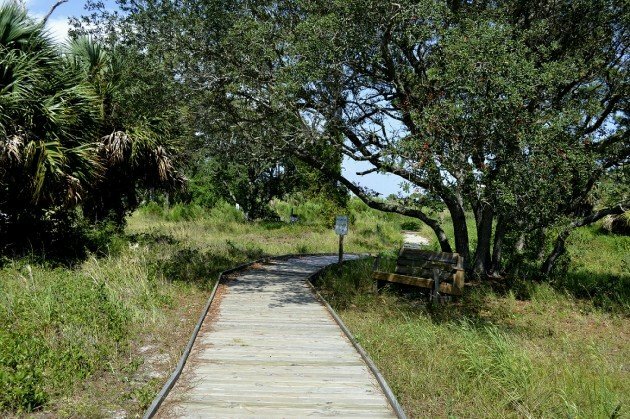 Two Great Horned Owl chicks had successfully fledged from Veteran’s Park at Baywalk, a small park that was once a three-hole golf course on Okaloosa Island. All the local birders had seen them, and though I arrived on the Florida Panhandle too late to observe them when they were young, I fervently wished to see them all grown up. Watching eBird, I was comforted to know they were still being frequently recorded, even though I had little luck as the weeks went by. Of course, my lack of owl sightings were mostly my fault; I neither arrived at the park early, nor stayed late into the evening. Until this past Sunday. My husband and I had had dinner nearby, and were near the park as the sun descended. More often than not my binoculars are in my car these days, and so we headed out onto the boardwalk to search for owls. A few birders had tried to give me directions to where they had last seen them. These directions always made perfect sense when I was jotting them down – go to the big pines along the path, parallel to the metal light poles – but they quickly became confusing the moment I actually tried to follow them. As I always did, I just shrugged and resolved to do my best. I pulled out my phone, looking up Great Horned Owl calls and playing them to familiarize myself with their unique hoots. “Did you hear that?” my husband asked, whirling towards me. “It’s my phone,” I replied, holding up the glowing screen. “I don’t think so,” he looked off in the opposite direction. “Yes, yes, yes,” I told him, continuing down the wooden trail. I had only made it a few yards when I stopped short, staring directly into the eyes of a large, gorgeous, Great Horned Owl. Brian had been completely right – a real owl had answered the one on my smartphone! I leaped up and down, fist-pumping the air for a few quick moments before whipping out my camera and snapping a series of rapid photos. 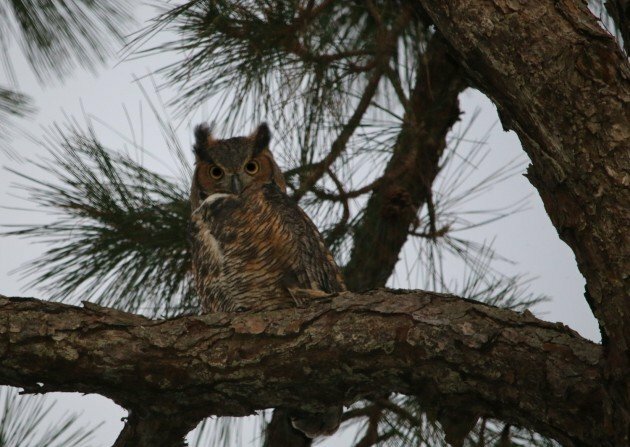 Even better, when I raised my binoculars to the pine tree branch, I saw the owl close up, filling the circular frame. More hoots and squeals echoed through the air. We searched among the needles and boughs, and saw not one, but two more Great Horned Owls! Almost the entire family had us surrounded. I even saw one throw up an owl pellet, a simultaneously gross and awesome experience. Three owl species seen, many more to go! Congrats! I’ve had success with that “play the song so I will know it when I hear it” thing myself.